In this work, a fluorescent, molecularly imprinted polymer sensor was developed for the rapid and direct sensing of trace alachlor. 2-Acrylamide-6-methoxybenzothiazole, synthesized via a simple one-step reaction with 2-amino-6-methoxybenzothiazole and acryloyl chloride, was used as both fluorescent reporter and functional monomer to prepare an alachlor-imprinted polymer. In this way, binding events produced physically detectable fluorescence signals, and the alachlor could therefore be quantified directly without any further treatment. Binding experiments demonstrated that the fluorescence intensity of the resultant polymer decreased linearly with increases in the concentration of alachlor, in the range of 1–150 μM, and with a detection limit of 0.5 μM. In addition, the fluorescent sensor exhibited significant selectivity toward alachlor over its potentially competing molecules of S-metolachlor, cyanazine, and cypermethrin. Finally, the proposed method was successfully applied for the determination of trace alachlor in corn seed samples, with excellent recoveries ranging from 95.58 to 103.83 %. 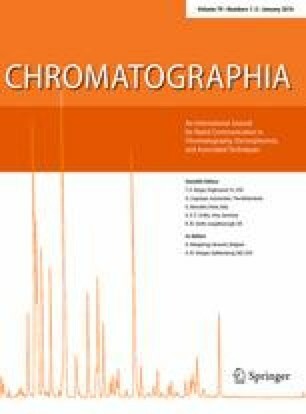 The developed method shows great potential for the determination of residual alachlor in real samples. M. Li and F. Shen contributed equally to this work. The online version of this article (doi: 10.1007/s10337-015-2998-4) contains supplementary material, which is available to authorized users. This work was supported by the Chinese National Scientific Foundation (21375146).